Whether a roadtrip or a cross country flight, traveling is something my family always looks forward to, especially since we don’t have the luxury to do it do often. But if you’re anything like me, whenever you travel, a little voice in the back of your mind says, “Is my home safe? What if a fire breaks out? Could a pipe burst? Could a thief break in while I’m away?” So even though I love holiday travel, I’m never able to completely relax. So I breathed a sigh of relief when I was contacted by Ooma—a leading internet home communications hub—with the opportunity to deliver 4 tips for keeping your home safe and secure when you’re on the road. Before you lock your doors and hop in the car, make sure you follow these steps to ensure your home is safe. Before leaving for an extended trip, it’s important to lock in a safe temperature in your central heating system. If you live somewhere with cold winters, don’t turn your thermostat off! To prevent your pipes from freezing, set the temperature lower than usual—ideally between 40 and 55 Fahrenheit. Live in a warmer climate? Leave the thermostat at about 69 Fahrenheit. Alternatively, you can completely avoid worry by controlling your thermostat remotely. Ooma detects when your thermostat is on “Away” mode and will automatically forward any home calls to your mobile device. Always turn off gas-powered devices such as stoves, ovens, and fireplaces, and unplug all appliances. This can prevent any accidental fires and potentially hazardous carbon monoxide leaks into your home, as well as save energy. This is especially important if you have pets at home who can’t defend themselves against unforeseen hazards. For an added layer of protection, be in the know—Ooma can warn you via text and direct you to call 911 when your Nest Protect smoke/carbon monoxide detector has been triggered. When leaving home for several days, tell someone you trust where you’ll be in case of emergency, such as a fire, burglary, or carbon monoxide leak. Friends staying in town or a thoughtful neighbor could be options. They can keep an eye out for suspicious activity and notify you of any out-of-the-ordinary occurrences. Ooma allows you to be notified immediately when 911 is dialed and you can call them or call police to investigate. 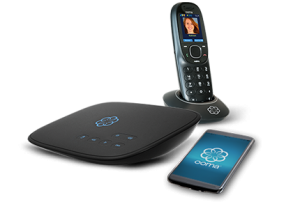 You can learn more about Ooma’s home monitoring system and buy an Ooma Telo at http://www.ooma.com.